The former home of Fuddruckers in Ellsworth will become a sports bar with 11 large-screen TVs on Feb. 4 called Sidelines. 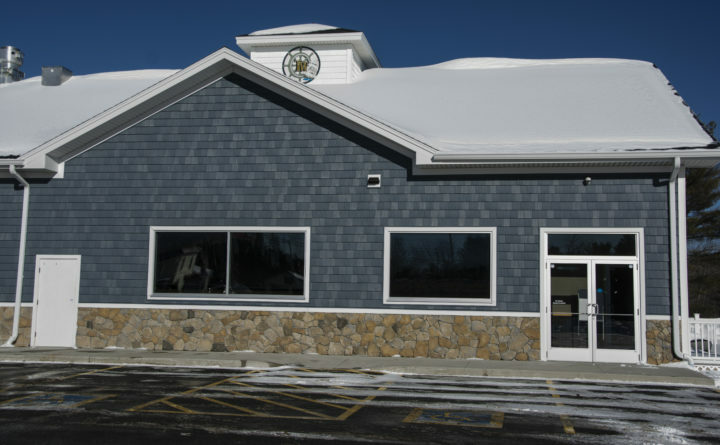 ELLSWORTH, Maine – Super Bowl Sunday is among the busiest days of the year for sports bars, but one bar moving into a space once occupied by Fuddruckers will miss it this year – by one day. The new bar and restaurant Sidelines will open Feb. 4, and for solid reasons, according to its co-owner, Jenn Barker. The storefront Barker and her husband Dan Barker are renting at the Tradewinds Market plaza off State Street needs a sprinkler system that cannot be installed any sooner. “That is the one thing that is holding us back from opening earlier,” Jenn Barker said. And no matter how seasoned its staff, any bar’s first day is usually its roughest, as everybody eases into their new jobs. Opening on Super Bowl Sunday and not having a staff ready for the crushing demand might alienate customers, she said. A pre-kindergarten teacher at the Eddington School, Jenn Barker will leave her job to run Sidelines and be joined by the school’s secretary, Mindy Perry, who is Barker’s best friend and will manage the restaurant. “We are both very outgoing, and having her by my side is really going to benefit my business a ton,” Barker said. Barker has years of experience waitressing, bartending and managing establishments in the Bangor area, she said. But Sidelines will be her first as owner. It will have 11 large-screen TVs, and a pool table and be strewn with jerseys and other memorabilia from professional sports. The Barkers would like to include local sports items as well, she said. Sidelines will serve light American fare, including pizza, chicken wings and other appetizers, Barker said. It will eventually employ as many as 10 part-time workers. “I really don’t want it to be considered a restaurant. I want it to be considered a sports bar with food,” she said.